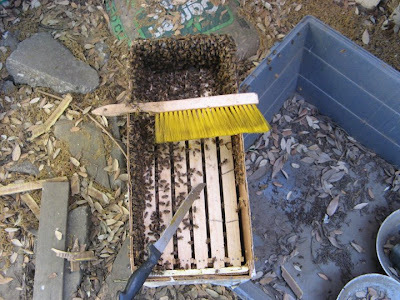 Backwards Beekeepers: Worms, meet bees. Today Kirkobeeo encountered bees in a worm bin. 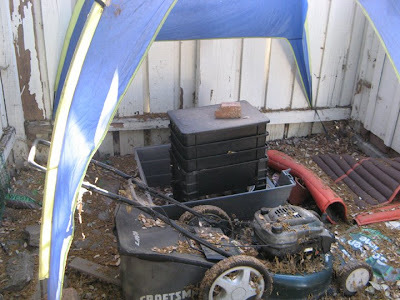 Now, the Ramshackles and Homegrown Evolutionists among us are no doubt puzzled that anyone would go to the trouble of acquiring a worm bin only to subsequently ignore it long enough to let bees move in. I also wonder: did the bees and worms have a conversation about sharing the space? Did they come to the agreement that the worms got everything under the dirt, and the bees everything above? It wouldn't surprise me a bit.